When the great Danny Blanchflower was coming to the end of his career in 1963-64, a young defender had to step up from the Reserves to fill his boots. Phil Beal, a blonde 5 feet 9 inch rookie was the man who took his chance. Born in Godstone, Surrey, Phil had gone on to play for Surrey boys and England Youth and he had signed as an amateur for Spurs in 1960 and become a professional in 1962. He made his first team debut in 1963 away to Aston Villa and went on to make 16 appearances for the first team that season which was the first season, for four years that Spurs had not won a trophy. Blanchflower had retired by the start of the following season and it was inevitable that the crowd would make comparisons between Danny and Phil. Initially taking the right-half berth, Phil was more defensive minded than Danny and many saw that he lacked the great skipper's attacking abilities. With a lot of criticism facing Phil at a time of transition in Spurs' history with both Bobby Smith and John White no longer around, Phil only made 8 appearances in 1964-65. Phil was to bounce back. He was very adaptable at a variety of positions and he filled both the right-half, the right back and left half roles admirably. He featured in 21 games in 1965-66 and he started in 26 games in the resurgence of Spurs in 1966-67. He did not make the FA Cup winning side of 1966-67 but was in both League Cup winning sides at Wembley against Aston Villa in 1970-71 and Norwich in 1972-73. He was also in the side that played both legs in the UEFA Cup Final against Feyenoord in 1973-74. He had fully established himself in the side in the late sixties and he only missed one game in the 1973-74 season and he consistently showed his calm, authoritative and composed style. A regular number 4 in the side by now, he was a good reader of the game and he frequently stopped opposing attacks by good timing rather than fierce tackling. Nevertheless, Phil could tackle well and he was a good distributor of the ball. 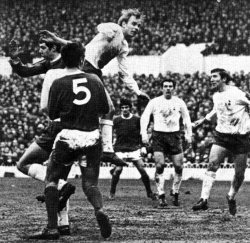 He was very composed in his own half and invariably took the ball from Pat Jennings to start another Spurs 'attack. Phil always seemed to have time and was a reassuring sight for Spurs' fans and did not seem rattled and this must have inspired his fellow defenders. Beal was unlucky on two accounts. Firstly, he started in the team when the great Double side was breaking up and no matter how well he performed, he was always going to suffer by comparison to the outstanding players of that side, especially Danny and John White who both had superb attacking skills. Secondly, he was playing in the same era as the great Bobby Moore, the England Captain, so Phil was unable to get into the England set-up. In many ways, Phil was not unlike the West Ham captain as they not only played in the same position, but had similar styles in being composed on the ball with immaculate timing and appearing unhurried in their movements. This was because both players were such good readers of the game that they usually knew when to challenge and when to tackle and where to send attackers they were marking to ensure as little threat as possible to their own teams' goals. Phil was also brave. In one game at Chelsea, Phil finished with both his arms and legs in bandages. He was so very committed and consistent. He finished his Spurs' career in 1975. He had made 330 League appearances in his time from 1963-1975 and he had made 420 appearances in all competitions. His consistency and loyalty were without question and his perseverance in overcoming the early comparisons with the Double team were rewarded. After leaving Spurs, Phil went on to play for Brighton, Crewe, Los Angeles Aztecs and Memphis Rogues in the USA. He now works as assistant manager for a car rental firm at Heathrow Airport and he hopes to retire to Cornwall eventually. He had it all mapped out on the field and his plans off it seem similar. Phil missed out on the big money era of soccer and earned little from his testimonial having to pay expenses for the match. He was a fine player for Spurs who is fondly remembered. He played 30 games for Spurs in Europe and it was a shame that he did not reach full International honours. His only real weakness was in only scoring one goal for Spurs. It was as a defender that he excelled and he loved the game which he gracefully played for 12 seasons for the first team.